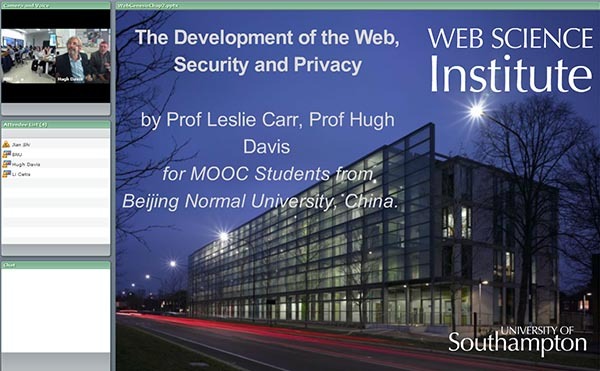 In September 2014, the University of Southampton Web Science MOOC, hosted on the FutureLearn Platform in the UK, was used as an integral component of an introduction to computer science course being delivered by Beijing Normal University. Chinese students were asked to register on the MOOC course so that they could access the resources in addition to attending lessons as normal, delivered by their own university. Online discussions were held between students and their Chinese teachers focussing on the MOOC resources and held on the China-based platform provided by WoLearn. In addition, online seminars were delivered by academics from Southampton with the summative assessment of the 87 students being undertaken by the Chinese tutors. Figure 1 illustrates the organisational arrangements between the different partners.